ENDUE promotes events throughout the year. These events are very important in that they allow us to connect with our community for awareness and fundraising. With music, food and all other fun-filled events and activities also serve vendors get to promote their products and services to the general public. By mixing good business with good works for the benefit of people with developmental disabilities, you will also help our cause in some measurable way and send a tremendously positive message to your employees, your customers, and the entire community where you do business. If nothing else, come and enjoy our events. They are fun, they are educational and they are a great opportunity for networking. Santa Claus visits San Mateo with a bag of fun at the Endue end of the year Christmas Party. Endue will be hosting our annual Pot of Gold dinner dance. Guests will have the opportunity to mingle with old and new friends and enjoy a delicious dinner, silent auction, live auction, music, and dancing by Van Morrison tribute band – Kevin Brennan and Wavelength. 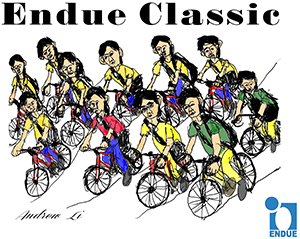 The ENDUE Bicycle Classic is an annual celebration of life and its wonderful gifts. Ride with us and enjoy the beauty of the SF Bay Peninsula while raising awareness of people who want to ride but can’t: those with developmental disabilities like Autism. If you are able, we hope you will grab a friend and join us at the ENDUE Bicycle Classic or be a sponsor of the event.